Teacher Curry Gray uses stop-frame animation as an introduction to the wider world of film. 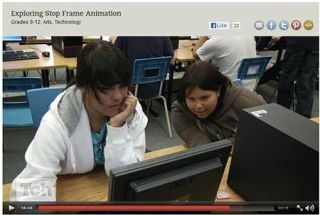 Students design shots, take pictures and use software to create an animated stop-frame video, which can be viewed by all in the school lobby. Gray notes that this technology lesson also teaches the importance of understanding the power of the camera to manipulate or deceive the viewer.